The web browser is by far the most-used application on the computer. 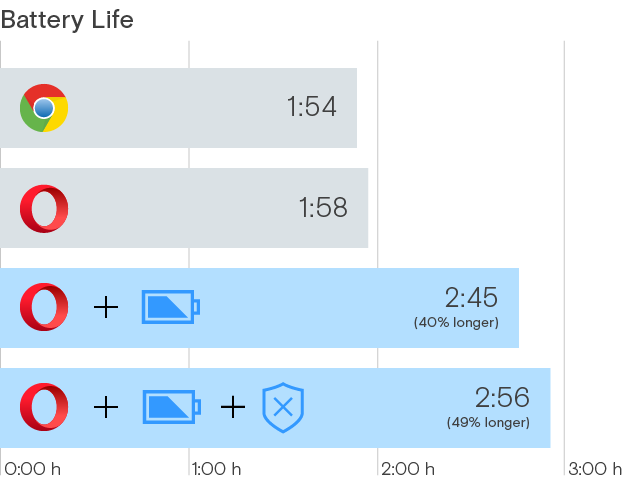 Hours of listening to music, watching videos, or simply having many tabs open drains your battery and reduces your laptop’s performance. Our new battery saver is today ready in the stable version of Opera for computers, after we tested it the in developer and beta channels. When we first released the battery saver, we got positive feedback from you. We really appreciate that, and today we would love it if you could help us spread the word about Opera’s new battery saver. Chromium/Blink with built in VPN, Ad Blocking and Battery Saver. 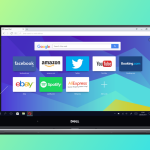 Somehow @opera became the best desktop web browser without anyone noticing. Please help us spread the word about Opera’s new battery saver! How good is the battery saver in Opera? Last month, we made several tests to find out how the battery saver performs. In some tests, the feature increased the battery life by as much as 50% comparing to other browsers, such as Google Chrome. After the initial release in the developer stream, some of you have been asking for more detailed test results. Together with the beta release, we presented a breakdown for the the initial tests as used for the developer release. There is one more thing we realized recently. If something consumes more energy, it usually gets warmer – basic physics. That’s why your laptop gets overheated during your heavy browsing sessions. This heats up your lap, sets off a loud and annoying fan, and can cause problems such as random blue screens or even data loss. We’ve made tests comparing the temperature of the bottoms of two laptops. One was running Opera with battery saver enabled and the other one Opera with the mode disabled. 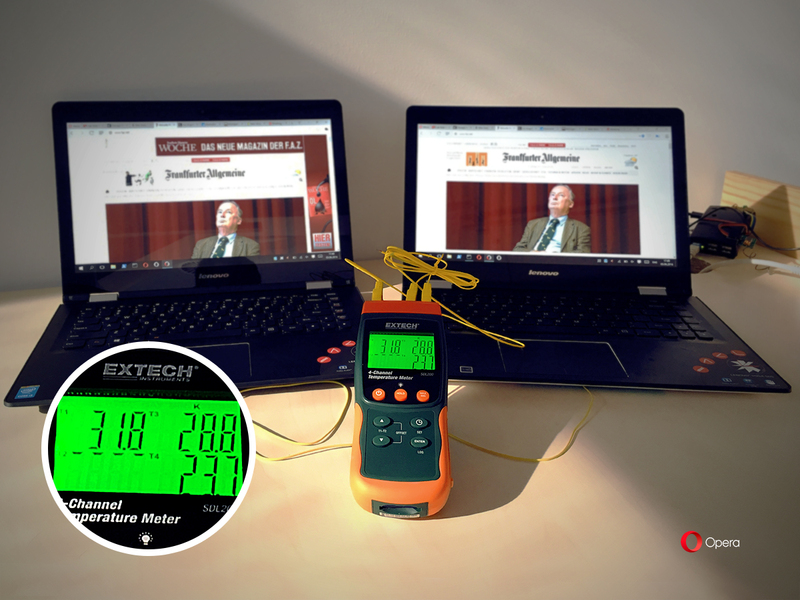 Test results with the new battery saver enabled showed that Opera can keep laptops over 3 degrees (C) cooler. It’s actually pretty nice difference, especially when you think about bringing your laptop along for summer fun and letting it bake your lap. Using the new power saver mode is easy. Once the laptop’s power cable is unplugged, the battery icon will appear next to the search and address field in the Opera browser. Click the battery icon to activate the power saver mode and flip on the switch. The browser will also detect when the laptop’s battery is running low and will suggest enabling power saver mode. Ad blocker – add your own lists. You can add your own block lists. To add your own custom list file, head to Settings and click the “Custom Block Lists” button in the ad-blocking section (note that “Show advanced settings” from the “Browser” panel must be enabled to see the button). Speed Dial improvements. Now, you don’t need to worry that you removed a website from your Speed Dial accidentally. You’ll now notice three little dots on hover in place of where the delete button used to be. The new button provides quick access to the features previously only available in the context menu, like opening in private tab, or removing a website from your Speed Dial. Add your own photo as theme. A while back, we introduced the “Create your theme” option in the theme manager. Now, this option is more visible for you. Just go to the Customize start page and click the ‘+’ button; then, use your own photos to create a theme. Extension button visible in the Speed Dial side panel. All extension users will have the extension manager always at hand. The extension icon is visible on side panel on the left side of the Speed Dial page. Change in version support for OSX. Starting from this version, we’re updating our requirements on Mac. Now, we’re supporting OS X 10.9 and higher. 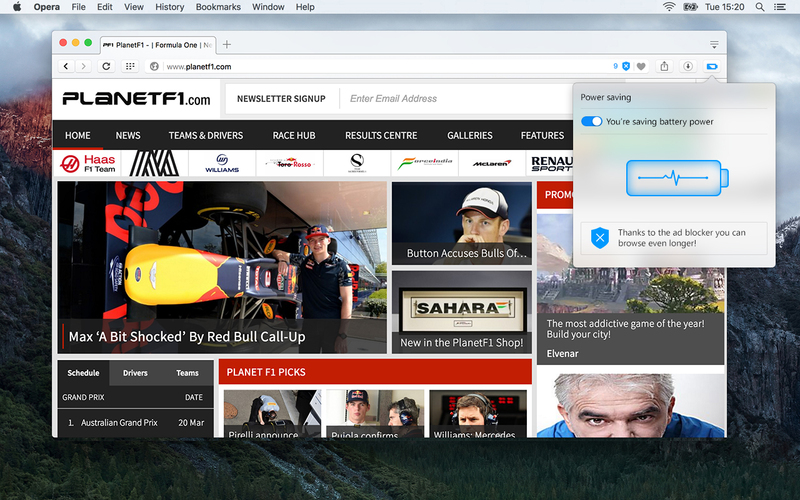 We are really happy to bring power saver, as the first major browser, to the stable version. Together with ad blocker and the video pop out, it makes Opera the browser that really responds on today user expectations. 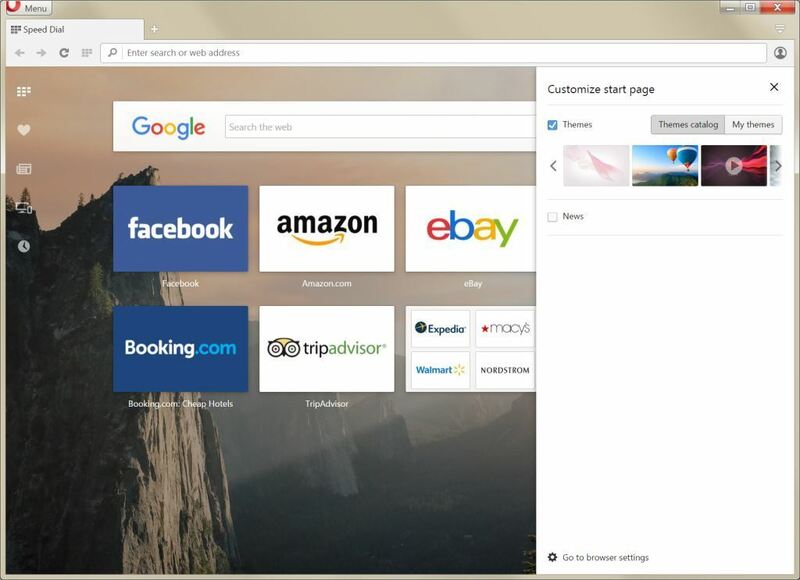 Download the latest Opera for computers, and let us know what you think about it in the comments. VP Engineering, Services. Been hacking with Opera Mini and Turbo servers most of my time at Opera. Currently privileged to work on performance with Opera's engine team.